On Thursday we woke to snow, not more than a centimetre, but snow. 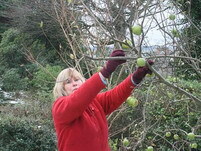 Frosts and wind over the preceding week had taken the last leaves off fruit trees, leaving roadside late apples looking like pre-Christmassy hung with the green or golden baubles of the later-ripening fruit. The Mysterious Large Apple in our front garden was no exception. For 9 years it has produced a small number of dense green fruit streaked with grey because it is in the shade; it is meant to be Ribston Pipin, but apart from the lateness of the crop (left to their own devices the apples will cling on till January and never get any riper) it bears no resemblance. Hence Mystery. Yet it grows like topsy, the blossom is magnificent and loved by bees. This year it grew hundreds of apples, and they got to a decent size and some went a slightly golder shade of green – one or two even got rosy flushes. Whether this was due to a warm, sunny summer or the deep freeze of last winter I am not sure, but with snow falling, we decided to pick the lot and store them (they do store very well, possibly for eternity). They all had to be washed and polished free of the grey streaks, and made baskets of pretty green apples which taste just OK but the skins are tough; peeled and cooked, they do the job. Update on taste progression at Christmas. And now, Sunday, we have 15cm snow and falling fast, thunder and lightning bizarrely, and strange lights in the sky last night, amid a glut of crazy frozen stars.